New Song "Sun" Available Now! This song is massively different than any song I’ve ever released before, not just in terms of its sound, but the heart and story behind the song also. It’s a monument and testament to everything God has done in my life during this incredible season of my life. In the past 7 months, I learned how to love and pour into others, I discovered what it’s like to walk in real joy and freedom, I found my voice and my confidence, I was miraculously healed from debilitating daily headaches, I walked through some really tough circumstances and discovered whole new levels of God’s love in the process, I found freedom from deeply-rooted issues and childhood wounds that I always thought I’d struggle with for the rest of my life, and most importantly, I entered into a very real friendship with Jesus, which has been the greatest thing ever. This song reflects and represents all of this, and that’s why it means so much to me. Every word was squeezed out of a season of very real growing pains, learning curves, and new revelation. Friends, it would mean the world to me if you played this song and really listened hard to the lyrics. “Sun” by Alanah Sabatini can be found on iTunes/Apple Music, Spotify, Google Play, and wherever else you get your music online. Support me on Patreon for just a dollar a month! Big news! I just launched a Patreon page for WAVECAT, my new music project! Patreon is an awesome service that allows people to financially support their favorite content creators and get exclusive content in return. Creating content, such as music or videos, is very time-consuming work and almost all of it is unpaid, so Patreon seeks to help creators make a living in return for their hard work. Why does WAVECAT need support? Within the first month after the release of WAVECAT's debut EP "Beginnings," we shot up Reverbnation's regional charts and already have received numerous requests to play shows in the area. Needless to say, WAVECAT's future looks pretty promising, and I want to keep this momentum going. However, it can't keep growing or getting better without some help. Some of you may know that being a musician isn't cheap. Everything from software/plugins to instruments is an investment. I cut down costs tremendously by using my own home studio for all my recording, but that comes with its own set of costs: plugins, software upgrades, gear repair, etc. Additionally, in order to make tracks sound as good as possible, I hire third parties to mix and master most of the music I release, as well as hire a graphic designer to design a good majority of my album art. In order to have WAVECAT's music available for you on major online stores and streaming services, I get charged $50/year for each album or EP and $10/year for each single. The money I make from music sales and streams on these services is negligible (1 stream on Spotify is worth about $0.006), and because WAVECAT is still trying to get off the ground, I need help in order to keep this music online. Thank goodness that my music production software and plugins were one-time payments, but other tools I use, like Photoshop (for some album art and social media graphics), SoundCloud Pro, and SquareSpace, charge me monthly or annually. Without these services, WAVECAT's online presence wouldn't be nearly as effective. This is something I don't do yet, but will be able to once I have Patrons. Patreon contributions will help me boost posts to get the word out about WAVECAT on platforms like Instagram, ReverbNation, and more. With Patreon’s help, I'll be able to move towards some exciting goals, such as playing local live shows, supporting independent graphic designers and videographers, and continually improving WAVECAT's quality of music. I'd also love to start making music live on Twitch or YouTube Live one day, so you guys can hang out with me in the music-making process. The possibilities are endless! 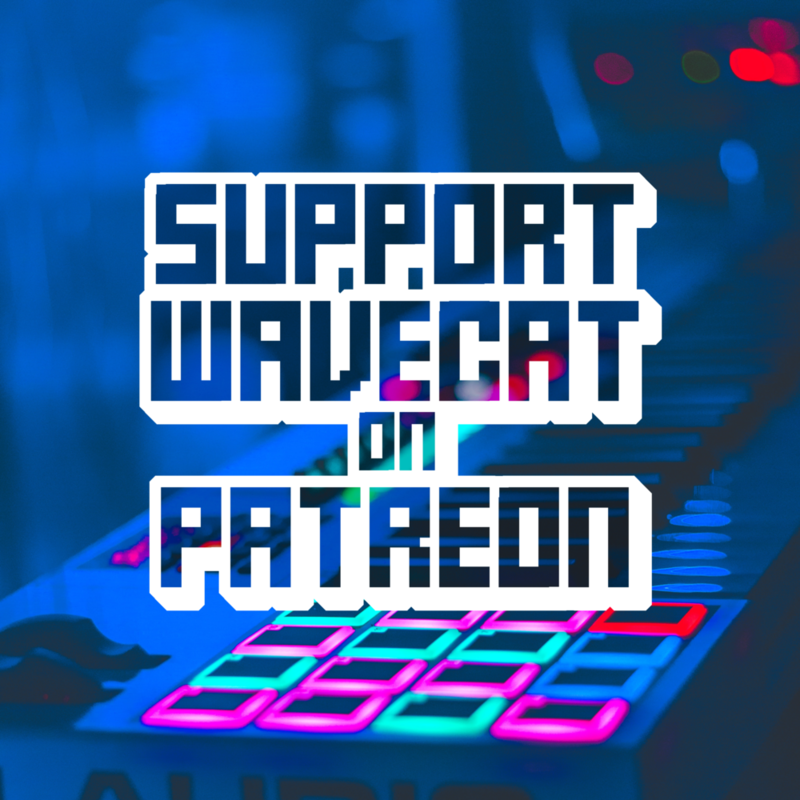 If you enjoy my music (or if you want to help support me financially as I finish school), consider signing up to be a patron of WAVECAT. The pricing tiers are easy ($1, $3, $5, or $10/month), and you will get exclusive merch and behind-the-scenes content in return for signing up. WAVECAT is something that I’m very proud of and that I see a lot of potential in, so I’m really excited to partner with you guys to keep it growing. Join the WAVECAT fam and become a patron today! Back in November, I released my second full-length album, "Overflow." This project consists of 9 songs written over the course of 2016 and 2017, and it was the very first time I wrote lyrics to my songs and released it into the world. While it was a significant milestone in my musical career to release my own lyrics, at the time I didn't think it was any more than just a bunch of words thrown together. But somehow, God had plans to use it and turn it into much more than that. It wasn't until this summer that I started noticing a trend as I listened to the songs in Overflow. As I began preparing to move for the very first time to an unfamiliar city, I immediately saw a shockingly strong connection between the lyrics I wrote and what I was feeling in anticipation of RSW. I wrote these songs way before I had any idea what 2018 would look like, let alone what I might be doing or feeling. The song September was written in September 2016, when I simultaneously started at a new job and joined a new band. The only lyrics are: "I thought I knew my plans, but I was wrong. I thought this was my home, but now I'm gone." Fast forward to now... I was sure of my plans to go into marketing, but I was wrong - God is definitely leading me straight to a School of Worship. And I thought Metro Detroit would be my home for a while, but I'll be gone in less than a month. "I thought I knew my plans, but I was wrong. I thought this was my home, but now I'm gone." Plus, I'm moving and starting school in September. Perfect, right? Past The Wall is a song that I wrote right after deciding to let go of some toxic friendships, stop caring what they thought of me, and really embrace who I'm meant to be. The whole theme of the song is basically that life is safer inside your expectations and comfort zone, but when you leave those boundaries, you find life and color and joy all around you. As I prepare for RSW, I find so much encouragement in those lyrics. Sure, leaving the safety of my home and friends is scary as heck, but things are going to be so much more exciting when I'm free from the walls of my comfort zone. "To be real, back inside the walls it's safer, but it's clear you never meant for me to hide behind my fear. So I left it all behind, and I can see you're here with me." Restarting Point is an instrumental song I composed in the beginning of 2016 right after releasing my first album. RSW marks a completely new chapter in my life and I can't help but mark it as a fresh restarting point in my life. Moment By Moment... Alright, listen guys. Moving has been stressing me the frick out, and it has been just a long to-do list of things that give me anxiety when I think about them (like figuring out financial stuff and getting new tires on my car, for example). But God has been teaching me to take each day & each moment as it comes, without worrying about the next. Before I know it, my long list of stress gets much shorter as I take things one at a time, moment-by-moment. There's a lot more room to trust God with the future when your main focus is on the present moment. Shift actually made me cry the night I found out about RSW in the first place. After finding out about RSW in April and feeling a strong push to apply, I felt a lot of fear and doubt - I kept asking, "is this really God speaking to me? I can't do something like this. This can't possibly be right." "Ready for change, for something more. You lead the way, I step through the door." "I'm casting off my doubt and fear; as I step out, I feel you near." "I'm facing fears. I'm crossing seas. You dry my tears. I'm breaking free." It was mind-blowing. Still is mind-blowing. New Light became the cry of my heart right after I found out I got accepted into RSW. I mean, seriously, who am I that God would call me to all of this and take such good care of me every step of the way? I don't deserve any of it. "Oh, who am I that you'd give me this life? All my days I will sing for your glory." Oh man, Overflow always has meant a ton to me. It's the album's title track for a reason. The melody, feel, and even the key it's in all resonate so strongly with my soul. I always meant for it to represent an outpouring of God's love, similar to a person standing under a waterfall - and as I navigate the preparation for RSW, it's reaching a whole new level of that love. Every step of this moving process keeps falling into place as I take steps forward in obedience, and I can't explain any of it except that it's Jesus providing and caring for me. I'm experiencing an actual overflow of His love over my life to a degree that doesn't even make sense. Listening to Overflow only makes me become overwhelmed with gratitude and awe. I know this blog post was a lot to take in, but I really wanted to share it with you. One of my favorite parts of being a creative person is that the things I create ultimately come from God, not me - so sometimes, he just completely takes over my music and turns it into something that I'll need to hear later. It's bizarre and wonderful, and it's just another reminder that I'm literally nothing without God. It is with great excitement that I share this news with you: My new cover of Reckless Love, which has only been out for less than a week, earned a featured spot on ReverbNation's homepage AND caught the attention of their senior curating team! Songs that earn a 7.5 (out of 10) rating or above on a crowd review get to be featured, and my Reckless Love cover made the cut with a 7.6 rating. My song is in the 93rd percentile of all ranked songs on ReverbNation, which is a big accomplishment! My feature slot will run for a week, starting on October 23rd. Being noticed by ReverbNation's curation team is also very exciting. Being curated can open doors to all kinds of opportunities in the music industry, including (but not limited to) record deals, brand partnerships, and promotion to millions of listeners. I'm not sure what (if anything) will come from this, but it's a sign that I'm doing something right and that people are enjoying my music. I'm very humbled and thankful for the opportunities that have been presented to me lately, and I'm looking forward to seeing where the next year takes me. To whoever may be reading this, thank you so much for supporting me and believing in me!